Update: The add-on has been removed by the author. There is no comparable extension available at this point in time. Duplicate contacts are an issue on today's Internet for many users. Many web services, including email or social networking sites, maintain a contacts - or friends - database, which consists of people the account owner knows. It is sometimes possible to synchronize or import contacts, but more often than not that is not the case. This results in a handful of independent contact databases that are not linked to each other and often contain duplicate contacts. 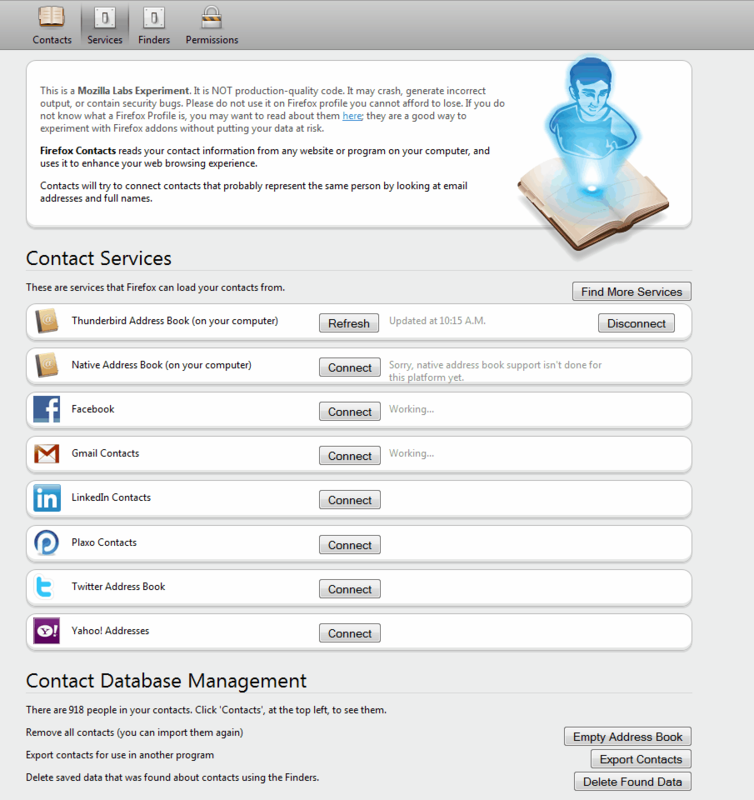 Thunderbird Contacts is a new add-on by the Mozilla Labs Team that is based on Firefox Contacts. The add-on tries to evolve " the address book of Thunderbird beyond what it currently is today". The idea behind the add-on originates from the fact that contact information are not necessarily only available in the address book of the email client, but also on websites and services. Thunderbird Contacts currently supports services like Facebook, Gmail, Twitter, Yahoo!, LinkedIn and Plaxo, next to the Thunderbird address book and the Mac address book. The add-on adds a contacts link under the Tools menu after installation. Contacts opens in a new tab in the email client with four sub-tabs available that lead to the add-on's functionality. The default page, Contact Services, allows a Thunderbird user to connect the email client to supported web services in order to pull contact information from them. The add-on automatically retrieves the information, and tries to merge the new contact information with existing information. 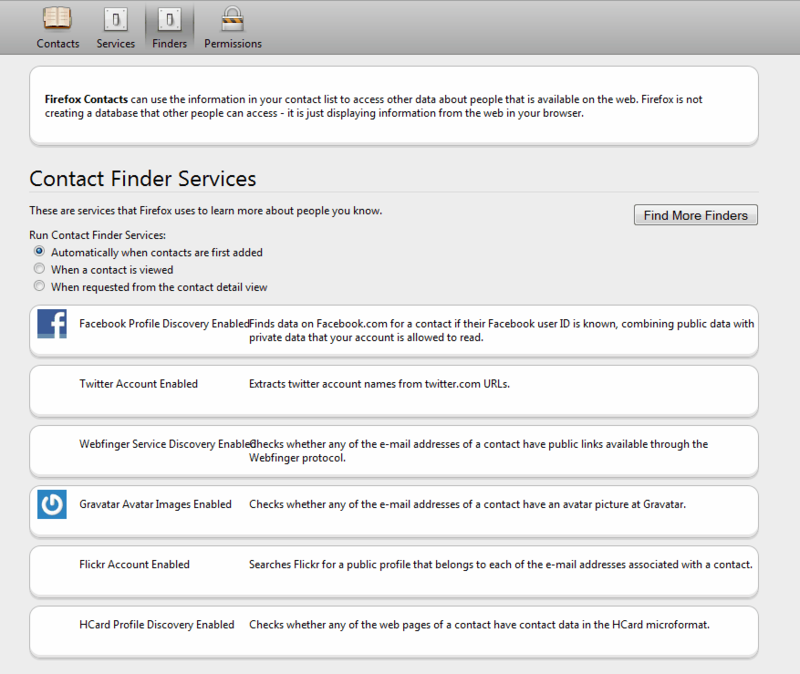 In addition to that, the contact finder service tries to find additional information about a contact by pulling information from Facebook, Twitter or Flickr among others. Options are to enable finder services automatically when contacts are first added, when a contact is viewed, or when requested from the contact detail view. A video has been created to demonstrate Thunderbird Contacts. Thunderbird users who want to try Thunderbird Contacts can download the add-on from the Thunderbird add-on repository. The add-on is only compatible with Thunderbird 3.1x to 3.2x versions.